Eleven of us sat down to a turkey dinner with all the trimmings yesterday. 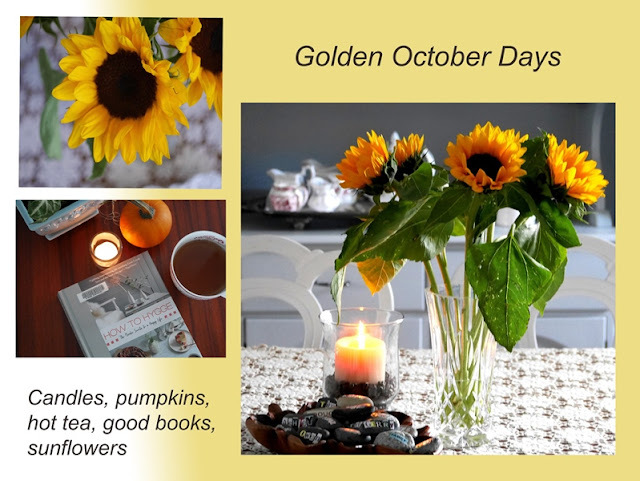 Although the holiday is technically Monday (the second Monday in October), we, like many families, have our big dinner on Sunday, followed by a relaxed Monday. I look at this photos and see the faces of some of the people I love so very much. For now, the little ones enjoy sitting at their own small table while the adults sit at the big table. I remember sitting at the children's table at family gatherings when I was growing up. Do you? Did you notice the top right hand photo? That's Katie, our daughter-in-law. For this particular dinner, I set the food out in the kitchen and we served our plates from their and brought them to the table to eat. After dinner was mostly done, Katie was up checking on the little ones and stopped by the stuffing casserole on the way back to the dining room. She mentioned how much she enjoyed it. She ate it from the pan. She was there long enough that I suggested she bring the whole thing to the table and sit down to enjoy it. So she did. And she posed very nicely for a photo. Much laughter ensued. On Friday evening, Owen and Ashley told us stories of their recent trip to Scotland, Stockholm, and Copenhagen. One thing they mentioned were the Cardamom Buns eaten with coffee in Stockholm. I had just read the How to Hygge book and remembered a recipe for the buns. Ashley suggested we make some, so we did. We used another recipe found on the internet. Baking time was tricky; some were slightly overbaked, but still delicious. Forming the dough was also tricky. My children wonder what has happened to their mother. I have never liked the colour orange. I tolerate it in marigolds, planted among the vegetables, never in the flower beds. Pumpkins are okay. So there was great teasing when they noticed two orange velvet cushions on the couches. What can I say? They suit the season and I'm okay with them, for now, although I get a little twitchy if I really look at them. I stitched the covers and they can easily be zipped off and replaced. Lovely October. Crisp nights, a bit of rain, lots of sunshine. Plenty of laughter. My favourite month. Lovely to have family all together. Like you, orange has never been a favourite of mine, perhaps more strongly...I can't bear it! Maybe if you think of your cushions as Tawny, or Maple leaf...it will help!! What a lovely gathering of beautiful people around your holiday table. So what is in the stuffing casserole? I do love a delicious stuffing. My daughter has changed her mind about the color orange through the years. Since she wears the color so well, I am glad. Happy Thanksgiving! Some wonderful days with family. Send the cool weather down here! Happy Monday! It's been a beautiful weekend - and we celebrate today. Somehow those golds and oranges and rusts are just right for this time of year. So many seem to claim October as their favorite month and that's easily understood. Your dinner looks nice and I too have an orange pillow on the couch and I have never had orange in my house before (other than a pumpkin). I actually like it. Happy Thanksgiving Day, I also enjoy dressing, especially my Moms, your gathering of family photos are so precious! Thank you for sharing. I have always adored the 'earth tones' and also 'jewel tones'. I used to wear those colors ALOT as a teen and then got away from them for a while, and have fallen back in love with them again. But I still also adore dark teals, rich burgandy and what can be better than black and white??? LOL. Dawn P.
You certainly looked to have enjoyed your wonderful Thanksgiving celebration, how nice to be surrounded by family. I do remember the days of sitting at the children's table, I actually quite enjoy sitting there these days with the grandchildren they are such a joy. There is nothing better than sitting around as a family enjoying each other, the food being an added bonus. What a beautiful Thanksgiving table. I liked how you used (real?) leaves as name cards. Your growing tolerance for the orange hue just shows that you continue to grow as a person! Yes, Lorrie, we always had a kids' table for holiday meals - quite often, there were more kids than adults!!! It looks like you had a wonderful time. 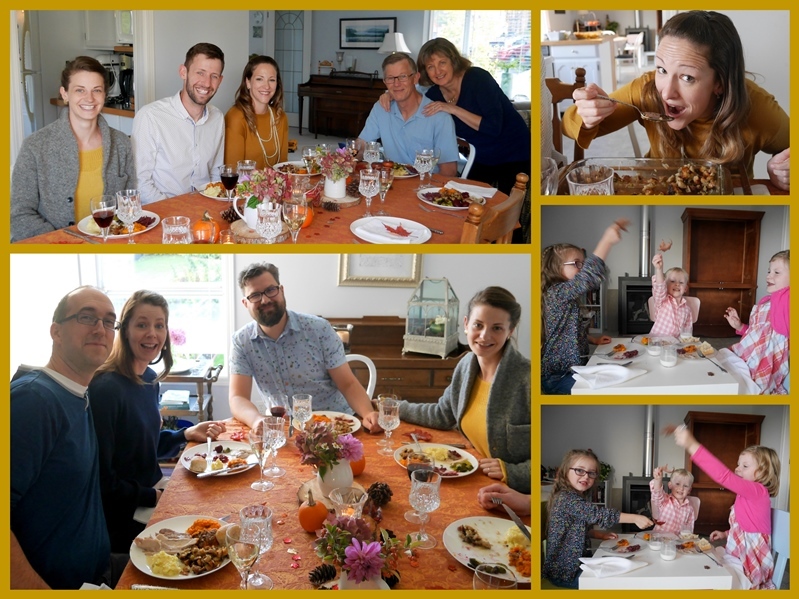 How cool that your daughter-in-law is so comfortable with all of you that she ate right from the dish and joined in the photo shoot! Have a wonderful week! I love making pillow covers that you can change up when you want...or for the seasons. The orange looks so nice with your decor. And of course the family pics are wonderful! Love the one of her eating from the dish...a girl after my own heart! Hugs! I am so glad you had such a nice Thanksgiving. We always do ours the night before, too. I love the kids' table. They always have so much fun with just the kids sitting there with their own jokes and tales. Happy Thanksgiving, now that it is almost all over... as too often I'm a day late and a dollar short! Your family Holiday dinner looks wonderful -- beautiful table and even more important obviously everybody is relaxed and having so much fun. I love that you and your daughters actually went ahead and made those yummy cardamon buns instead of just talking about how good they were! Happy Thanksgiving to you and yours. I think it's a great idea to celebrate on Sunday and then sleep it off on Monday. :) Too funny about your orange aversion. Orange is not a color I gravitate to but our family room is a cinnamon color. Glad you could all be together around the table. Such a blessing! What a lovely dinner with your beloved ones! We don't celebrate Thanksgiving in Finland... Orange is a challenging color for me too, but your cushion looks very beautiful. Have a nice week Lorrie. Belated Happy Thanksgiving to you! Your family all look so happy to be gathered together in your lovely home, your DIL is a hoot and a good sport to allow you to share that photo. I was amazed when I saw the Orange cushion because it's not one of my favourite colours either yet last month I brought two very similar cushions, two white and orange patterned cushions and an orange throw home from IKEA, the SP thinks I've gone mad but I like the new look in the sitting room, well at least until Christmas! It looked like a wonderful Thanksgiving at your home, Lorrie! I like to serve big holiday dinners the same way--we do a buffet and everyone fills their plate and sits at the table. They can go back for seconds or thirds. I hope to embrace more hygge this winter--it sounds very cozy. I had to smile at your tolerance for orange. When I was first married in the early 70's orange was the "in" color and was everywhere. I had quite a bit in my house. I was very tired of it afterward and later decorated with neutral shades, then shades of blue, then green and burgundy. When we moved to Colorado I was surprised that a rust colored sofa and chair became my furniture pick. and brought comfort to me. I guess shades of orange are making a come back! The Thanksgiving dinner sounds delicious, but even better to have family and friends around. Have a wonderful week and thank you for stopping by my blog this week. It's lovely to see your orange and yellow. I had known it but now I was reminded when was Canadian Thanksgiving as I was confused with America’s. The table decoration is beautiful and the mosaic of your beautiful, happy family is so nice. The chic, deep orange cushion looks autumnal. You made me get into the mood of autumn. Here in my part of the world, it was very unusually 30 degrees C like summer today. Happy Belated Thanksgiving to you and your family, Lorrie! It looks like it was a wonderful family event. I'm like you, and do not like orange, but I do have some orange decor for Fall. Really, your pillows look beautiful on your sofa. I think I've always been into hygge, even before I knew it was a word!! I love seeing your family celebration. It just puts me in the mood for our upcoming Thanksgiving next month. Love the orange pillow too, smiling! And those cardamon buns look and sound delicious. I love Canadian Thanksgiving! Thanksgiving is my favorite day of the year, but I have often wished that we Americans would (sensibly, in my opinion) celebrate in October, leaving a little more space between holidays. Oh well, I love it no matter when it is! Looks like a good crowd for the big feast. What a good looking bunch ;) Those rolls look delicious. And I love your table setting with the maple leaves. I never sat at a kiddie's table, although I do remember not quite reaching the dining room table when I was small. My kids and all their cousins sat at a kids' table for the longest time. When they finally joined the adult table, we had four tables end to end in my parents' living room (it was a huge room). I have only one photo of those wonderful days. Happy Thanksgiving. LOVELY family photos. I love the great british baking show and the buns made me think of that! Aw - love seeing the beautiful, happy family! Pretty table - love the tablecloth. I am with your daughter-in-law, I think stuffing is the best part of the dinner, too. Yes, I do remember sitting at the 'kids' table, and I also remember that first year when I was old enough to sit at the 'grown-up' table, too. I felt so important. Those buns look yummy! My bedroom was yellow and orange as a teenager. What can I say - it was the 70's! haha! I'm late catching up but need to wish you a happy belated Thanksgiving! I love seeing family around a table and so cute to have the little ones at their little own little table! I kept debating back and forth about separate tables. It's crazy to think we have more kids than adults now! Also had to smile at your hard time with the orange ... I totally feel the same. It's a color that just does not blend well, except for how the Lord blends it in the autumn colors outside. I love it there! I literally LOLed at your "I get a bit twitchy if I really look at them..." comment. I am not a fan of orange either!! Red, I love... but if it ventures too much in the orange direction, it's outta here! I have felt that way for so long I don't suppose I will ever change (feel the same way about chartreuse, although otherwise green is one of my very favorite colors.) Happy late Thanksgiving to you and yours.